Crossover hits have a long distinguished history in country and pop music. By definition, they are songs considered country by genre, but pop audiences embraced them and took them into the top 10 on the Billboard Hot 100. In the early years of rock and roll, there was sometimes little distinction between a country and an early rock and roll song. This list begins in the 1960s with country and evolves throughout the years. Willie Nelson was a 20-something songwriter and bass player in Ray Price's touring band when he wrote the song "Crazy." It was first offered to the country singer Billy Walker, but it was turned own because he felt it was written for a woman to sing. Patsy Cline had emerged as a country star with her big hit "I Fall To Pieces." However, she had not yet reached the pop top 10. Patsy Cline's recording of "Crazy" is considered an all-time classic of country pop. It includes Elvis Presley's backup singers the Jordanaires and legendary Nashville piano player Floyd Cramer. "Crazy" became a #2 country smash and was Patsy Cline's only top 10 pop hit. The song's success made Patsy Cline an even bigger star. Tragically, she died less than two years later in a plane crash. Mary Frances Penick was better known as country singer Skeeter Davis. She first hit the country charts as one half of the duo The Davis Sisters. The pair were involved in a car accident in 1953 that killed Betty Jack Davis, Skeeter Davis' singing partner. She performed with Betty Jack Davis' sister Georgia as The Davis Sisters for three more years before deciding to get married and retire from the music business. She returned to the music business in 1958 and became a solo country star. Arthur Kent and Sylvia Dee wrote "The End of the World" inspired by Sylvia Dee's sorrow at her father's death. Featuring the piano work of Floyd Cramer, Skeeter Davis' recording of the song includes a spoken section in addition to her singing. It is accompanied by a dramatic key change and straddles the sound of modern country music and teen idol pop. "The End of the World" reached #2 on both the country and pop charts and became Skeeter Davis' signature song. it was performed at both her funeral and the funeral of producer Chet Atkins. Roger Miller gained his first music industry success as a Nashville songwriter in the 1950s. He signed a recording deal with Decca in 1958, but it would be six years before he would become both a country and pop star. After relatively little success as a recording artist, Roger Miller lost interest in his music career and was dropped from his recording contract. In 1964 in need of cash, he signed a contract with rising label Smash Records. His first two releases were "Dang Me" and "Chug-a-Lug." They both were major country-pop crossover hits landing in the top 10 on both charts. In 1965 Roger Miller released "King of the Road," the song that would become his best-remembered hit. It was inspired by a sign on the side of a barn that read, "Trailers for sale or rent." The song humorously details the life of a hobo who considers himself, "King of the road." The song was a #1 country and easy listening smash while peaking at #4 on the pop chart. Roger Miller's recording of "King of the Road" earned five Grammy Awards including Best Country Song and Best Rock 'n Roll Single. The landmark song "Harper Valley PTA" helped establish songwriter Tom T. Hall in Nashville with the nickname "The Storyteller." The song tells the story of Mrs. Johnson, a widow with a teenage daughter, who becomes furious when a note from her daughter's school claims she has been exhibiting scandalous behavior. It goes on to give details of, "The day my mama socked it to the Harper Valley PTA." Singer Jeannie C. Riley was just beginning her career when she recorded "Harper Valley PTA." The song was a smash hit reaching #1 on both the country and pop charts. Jeannie C. Riley was the first woman to top both charts with the same song until Dolly Parton did the same with "9 to 5" more than a decade later. "Harper Valley PTA" received the Grammy Award for Best Female Country Vocal Performance and earned nominations for Record and Song of the Year. It later inspired both a movie and TV series. Although he found his home in the country music community, the singing voice of Charlie Rich owes more to R&B and jazz. Early in his career he struggled to find significant hits recording for Sun Records and then Smash. However, in the early 1970s, working with countrypolitan producer Billy Sherrill, he hit upon a sound that finally made him a star. The single "Behind Closed Doors" became Charlie Rich's first #1 country hit in 1973 and broke into the top 20 of the pop chart. The follow up was "The Most Beautiful Girl." It was first written and recorded in 1968. The heartbreaking song became a #1 smash across country, pop, and adult contemporary charts. It was also a top 10 pop hit in countries around the world making Charlie Rich an international pop superstar. Australian singer Olivia Newton-John first hit the US pop charts in 1971 with a cover of Bob Dylan's "If Not For You." However, she struggled for a follow-up. In 1973 she recorded the song "Let Me Be There" written by John Rostill, a member of Cliff Richard's backing band The Shadows. The country influenced recording was a top 10 hit on both country and pop charts. For her follow up, Olivia Newton-John turned to another John Rostill song "If You Love Me (Let You Know)" that helped firmly establish her as a country-pop crossover star. The song hit #2 on the country chart and #5 pop. Like "Let Me Be There" it includes a distinctive bass harmony vocal by British vocalist Mike Sammes. After three more country-pop crossover smash hits, Olivia Newton-John's fortunes faded until she returned in 1978 reworking her image into that of a mainstream pop artist. Billy Swan worked as a successful country songwriter in Nashville in the latter half of the 1960s. However, he did not record on his own as a solo artist until the mid-1970s when he signed a recording contract with Monument Records. "I Can Help" is recorded in a rockabilly style and includes the distinctive sound of Billy Swan himself on a portable Farfisa organ. The song was a #1 smash hit on both country and pop charts. In addition, it became a #1 hit on pop singles charts around the world. However, despite a string of country chart placements into the late 1980s, Billy Swan never approached the success of "I Can Help" again. Through much of his career, Glen Campbell frequently crossed over from the country charts to pop. His #1 country smashes "Wichita Lineman" and "Galveston" both hit the top 5 on the pop singles chart as well. However, by the mid-1970s, although he was still regularly hitting the country charts, he had not reached the pop top 40 since 1971. "Rhinestone Cowboy" was written and recorded by Larry Weiss in 1974. It climbed to #24 on the adult contemporary chart but failed to cross over to any other genres. Glen Campbell heard the song, identified with the subject matter, and decided to learn it while touring in Australia. When he returned to the US, he was approached by his label Capitol Records with a request to record a new song "Rhinestone Cowboy." Recording it felt like destiny, and "Rhinestone Cowboy" became the biggest hit of Glen Campbell's career thus far. It became the first song to simultaneously top the country and pop singles charts since Jimmy Dean's "Big Bad John" in 1961. It was part of a huge surge in country-pop crossovers with six songs hitting #1 on both the country and pop singles charts in 1975. "Rhinestone Cowboy" earned a Grammy Award nomination for Record of the Year. Mexican-American musical pioneer Freddy Fender had a promising regional career as a recording artist in 1960 when he was arrested for marijuana possession and forced to spend nearly three years in prison. By the end of the decade, he was working as a mechanic and playing music on the weekends. The song "Before the Next Teardrop Falls" was written by Nashville Songwriters Hall of Fame Member Ben Peters and his then secretary Vivian Keith in 1967. It became a minor chart hit in recordings by Duane Dee and Linda Martell. In 1974 producer Huey P. Meaux asked Freddy Fender to record overdub vocals to go with an already recorded instrumental track. Freddy Fender said, "I was glad to get it over with and I thought that would be the last of hit." Freddy Fender's soulful tenor vocals proved to be irresistible and the recording became a #1 hit on both country and pop charts finally establishing Freddy Fender as a star. He would follow the success with seven more top 10 country hits. By the mid-1970s BJ Thomas was a well-established adult contemporary pop star. He had recorded classics such as "Raindrops Keep Fallin' On My Head," "I Just Can't Help Believing, and "Rock and Roll Lullaby." His career hit a dry streak in 1973 and 1974 prompting BJ Thomas to try a country pop sound with ABC Records. The single "(Hey Won't You Play) Another Somebody Done Somebody Wrong Song" became a #1 country-pop crossover smash. It was BJ Thomas' biggest hit since "Raindrops Keep Fallin' On My Head." After scattered follow-up country hits, BJ Thomas focused on country music beginning in the early 1980s for late-career success with four more top 10 hits. John Denver was one of the biggest country-pop crossover artists of the 1970s. His breakthrough hit "Take Me Home Country Roads" hit both charts in 1971. He had hit #1 on both charts by 1975, but no single John Denver song had yet #1 on both the pop and country charts. "Thank God I'm a Country Boy" was written by John Martin Sommers, a member of John Denver's backing band, while on a road trip from Aspen, Colorado to Los Angeles. He says that it came to him at a time that he was feeling "peaceful, happy and content" with his life. Recorded live, the song topped both the pop and country charts one week apart from each other. Crystal Gayle is the younger sister of country music legend Loretta Lynn. Her debut single "I've Cried (The Blue Right Out of My Eyes)" was written by Loretta Lynn. It was released in 1970 and had minor chart success, but it was not until 1974 that Crystal Gayle first reached the country top 10. By 1977 she had a series of five top 10 country hits including two that went all the way to #1. Three of Crystal Gayle's top 10 country hits had been written by Richard Leigh. While looking for follow-ups, Crystal Gayle's regular producer Allen Reynolds visited Richard Leigh and discovered "Don't It Make My Brown Eyes Blue." Released in August 1977, the song went to #1 on the country chart and #2 pop. It earned Crystal Gayle a Grammy award for Best Female Country Vocal. She enjoyed a string of 24 more top 10 country hits over the next decade but never again achieved the same pop chart success. Charlie Daniels spent more than 15 years as a journeyman country and southern rock musician before he became a star with his country-pop crossover "The Devil Went Down To Georgia." he landed a top 10 pop hit in 1973 with the novelty classic "Uneasy Rider." His 1976 album Saddle Tramp hit the country top 10 and established the Charlie Daniels Band in the eyes of country music fans. The engaging storyline of "The Devil Went Down To Georgia" helped it cross over from country to pop. The song's protagonist is a boy named Johnny who makes a deal with the devil to engage in a fiddle competition. His soul is at risk, but ultimately Johnny wins defeating the devil's contemporary rock with classic bluegrass influenced fiddle playing. The song was a #1 smash on the country chart and went to #3 pop. Beginning with her first country chart hit "Dumb Blonde" in 1967, Dolly Parton became one of the most enduring of country singer-songwriters. She first topped the country chart in 1970 with "Joshua" and kicked off a string of four consecutive #1 country hits in 1973 with her classic "Jolene." Her first big country-pop crossover came in 1977 with "Here You Come Again" that kicked off another string of three country #1 hits and it climbed all the way to #3 on the pop chart. Dolly Parton was asked to write the theme song for her film debut in 9 to 5. She co-starred along with Jane Fonda and Lily Tomlin. The song is a female protest for fair treatment in the workplace and blends country with uptempo contemporary pop. It went to #1 on both the country and pop singles charts earning Dolly Parton Grammy Awards for Best Female Country Vocal and Best Country Song. It also received an Academy Award nomination. By 1980 Kenny Rogers was one of the most successful country-pop crossover artists of all time. Between "The Gambler" and "Coward of the County," four consecutive songs went to #1 on the country chart and hit the top 10 on the pop chart. However, by 1980 he still had not earned that elusive #1 pop hit. Enter Lionel Richie of R&B group The Commodores. Kenny Rogers has said, "The idea was that Lionel would come from R&B and I'd come from country, and we'd meet somewhere in pop." The idea was a major success and topped the country, pop, and adult contemporary charts. Lionel Richie's production work was his first major effort outside of The Commodores and would help lead to the kickoff of his solo career within two years. In a rare occurrence, "Lady" even crossed over onto the R&B singles chart, and it spent six weeks at #1 pop becoming the only #1 pop hit of Kenny Rogers' solo career. Before the use of his recording of "Lookin' For Love" as a centerpiece in the hit movie Urban Cowboy, singer Johnny Lee had achieved moderate success on the country singles chart with his reworking of Rick Nelson's "Garden Party" into "Country Party" reaching #15. He was a frequent performer at Mickey Gilley's country music club Gilley's that was a key location for the shooting of much of Urban Cowboy. The song "Lookin' For Love" had been rejected by more than 20 recording artists. However, songwriter Bob Morrison included it in a group of songs pitched to producers of the upcoming film Urban Cowboy. Reportedly the movie's star John Travolta liked the song. Johnny Lee recorded the song, and despite complaints from critics, the song became a major country-pop crossover. It topped the country chart and went to #5 pop turning Johnny Lee into a star. He earned a Grammy Award nomination for Best Country Male Vocal. Johnny Lee went on to top the country chart four more times. Like many successful country performers, Eddie Rabbitt began his career writing songs for other performers. Among his successes were Elvis Presley's 1970 hit "Kentucky Rain" and Ronnie Milsap's 1974 hit "Pure Love." In 1976 he released his country breakthrough solo album Rocky Mountain Music. It included the #1 chart hit "Drinkin' My Baby (Off My Mind)." He returned to #1 on the country chart in 1978 with "You Don't Love Me Anymore," and it kicked off a string of releases in which 11 out of 13 singles went to #1. In 1980 the song "Drivin' My Life Away" crossed over to the top 5 on the pop chart. Eddie Rabbitt's crossover success reached its peak with "I Love a Rainy Night." The song had its origins in a fragment of a song that Eddie Rabbitt wrote in the 1960s late on a rainy night. With rockabilly influence, the song became a massive hit. It followed Dolly Parton's "9 to 5" to #1 on the pop chart, and to date is the last time two country songs were consecutive #1 pop hits. The song was the eight out of Eddie Rabbitt's total of 17 #1 country hits and also reached the top of the adult contemporary chart. Wille Nelson began his long career in the music business in the 1950s as a radio disc jockey. While embarking on a solo recording career in the 1960s, he also wrote hit songs for other artists including Patsy Cline's country-pop crossover classic "Crazy." He had a string of minor country chart hits for more than a decade until his 1975 album Red Headed Stranger and the #1 version of the country classic "Blue Eyes Crying In the Rain" made him an outlaw (nonconformist) country superstar. "Always On My Mind" is a contemporary pop standard. Songwriter Wayne Carson says he wrote the basics in 10 minutes and then completed it in the recording studio with Johnny Christopher and Mark James. Brenda Lee had a minor country chart hit with the song in 1972, and Elvis Presley took it to #20 on the pop chart later in the year. It was Willie Nelson's idiosyncratic emotional performance that turned the song into a classic and the performer into a pop icon. "Always On My Mind" topped the country chart and went to #5 pop. It earned Grammy Awards for Song of the Year and Best Country Song. In 1983 Kenny Rogers and Dolly Parton were both country superstars who had become major pop icons as well after hitting #1 with their own solo songs in 1980. Their collaboration on "Islands In the Stream" is one of the most revered duet of country stars of all time. Barry Gibb of the Bee Gees and his production partners Albhy Galuten and Karl Richardson worked on Kenny Rogers' album Eyes That See In the Dark. One of the songs "Islands In the Stream," originally written for Marvin Gaye, was first recorded as a Kenny Rogers solo. Dissatisfied with the results, he asked his good friend Dolly Parton to join him and make it a duet. The result was an instant classic which topped both the country and pop charts becoming the second pop #1 for both artists. 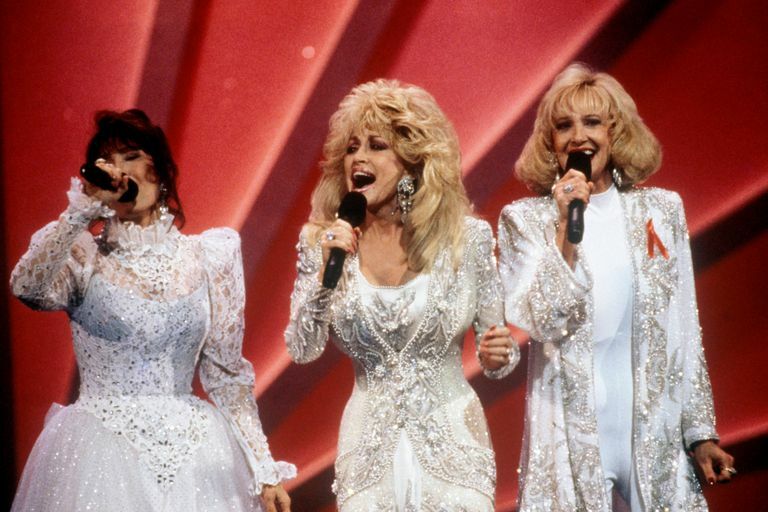 Country and pop music went on distinctly different paths for most of the last half of the 1980s and the first half of the 1990s. That changed in the late 1990s. Leading the charge were the collaborations by rising Canadian country artist Shania Twain and her husband rock producer Robert John "Mutt" Lange. She became a major country star with here second album The Woman In Me which included four #1 country singles. Shania Twain's third album Come On Over released in 1997 took her into the pop mainstream while maintaining her strong country following. The single "You're Still the One" was written about the couple's own relationship. It hit #1 on the country singles chart and #2 pop in May 1998. It spent nine consecutive weeks at #2 on the pop chart but did not reach the top. "You're Still the One" received four Grammy Award nominations and won Best Country Song and Best Female Country Vocal while losing Record and Song of the Year. Country band Lonestar first hit the country charts with their top 10 hit "Tequila Talkin'" in 1995. By 1999 the group had released five top 10 country hits including "Come Cryin' To Me" which went all the way to #1. Lonestar released "Amazed" as the second single from their third studio album Lonely Grill. It climbed to the top of the country singles chart and spent a phenomenal eight weeks there. It even crossed over into the pop charts and peaked at #24. In what soon became a relatively common occurrence, the song was remixed for pop audiences and then re-released to the radio. This time it went all the way to #1 on the pop charts creating a new kind of country-pop crossover. It was the first country hit to top the pop chart since 1983's "Islands In the Stream" by Kenny Rogers and Dolly Parton. Another country song did not hit the top of the pop charts until Taylor Swift's very pop oriented "We Are Never Ever Getting Back Together" reached the top in 2012. Faith Hill moved to Nashville at the age of 19 to pursue her country music dreams. Her efforts met with little success until she began singing backup for songwriter Gary Burr. A Warner Bros. executive discovered her in one of the performances and signed Faith Hill to a recording contract. Her 1993 debut album Take Me As I Am met with significant commercial success. Her first two albums generated eight top 10 country hits. In 1998 she broke into the pop charts with the single "This Kiss" which hit #1 country and peaked at #7 pop. "Breathe" was selected as the title song and first single from Faith Hill's fourth studio album. It was a big hit across both country and pop genres reaching #1 country and #2 pop. The song also spent a phenomenal 17 weeks at the top of the adult contemporary chart. "Breathe" won Grammy Awards for Best Country Song and Best Female Country Vocal. Beginning as a teenager, Taylor Swift rewrote the rules for country-pop crossovers. Taylor Swift's debut single "Tim McGraw" reached the country top 10 and made a minor impact on pop charts at #40. Her follow up "Teardrops On My Guitar" began to break down barriers. It peaked at #2 on the country chart and production that leaned toward pop took the song to #13 on the Billboard Hot 100 and the top 10 at mainstream pop radio. For her second album Fearless, Taylor Swift released the Romeo and Juliet inspired "Love Story" as the first single. It made her into simultaneously a country and pop star. The song peaked at #1 on the country chart and #4 pop. Taylor Swift soon turned into one of the biggest country-pop crossover stars of all time. Ultimately in 2014, she announced that her album 1989 would be her first entirely pop release. Taylor Swift's transition from country to pop star was complete. The trio of Hillary Scott, Charles Kelley, and Dave Haywood all had music in their families. When the trio came together as Lady Antebellum they first appeared on record as guest vocalists for the Jim Brickman single "Never Alone." The group quickly found success after being signed to Capitol Records. They scored two top three country hit singles from their debut album. The band co-wrote the title song of their second album "Need You Now" with veteran country songwriter Josh Kear. It quickly became another #1 country hit for the group and crossed over to mainstream pop radio resulting in a #2 peak on the Billboard Hot 100. With strong critical acclaim, "Need You Now" won Grammy Awards for Record of the Year, Song of the Year, Best Country Song, and Best Country Performance By a Duo or Group. The duo of Tyler Hubbard and Brian Kelley met while students at Belmont University. Following graduation, they decided to give themselves two years to succeed as a country music duo and formed Florida Georgia Line. Their second EP It'z Just What We Do broke into the top 20 of the country album chart. The song "Cruise" was the first single released from the duo's hit EP. It was also later included on their first full-length album Here's To the Good Times. The song hit the top of the country radio airplay chart in December 2012 just after the release of the album. It ultimately spent a record 24 weeks at the top of the country songs chart. The original version of "Cruise" peaked at #16 on the pop chart. However, in April 2013 a new remix featuring rapper Nelly was released. It ultimately peaked at #4 on the pop chart. With sales of over seven million, "Cruise" is the bestselling digital country song in history.